I’ve managed to continue my scientific experiment on my body by running 100 days in a row. The rules were simple enough: outdoors, at least 2 miles each day, running. I did that since September 1, and recently passed 100 consecutive days. Sane people would now realize it’s time for a break. But some of the rest of us are thinking: maybe this experiment is worth continuing. When you run every day, that means you run wherever you are. For this stretch that’s covered Washington, Idaho, California, and Cork, Ireland. Here’s a recap. Washington: The joy of running in the Pacific Northwest in the fall and winter can be summed up in three words: cold, wet, wind. For full effect I also include ‘dark’ on a regular basis, having started runs at 12:30 a.m. and after 11 p.m. Things are unusually dry here for the past month, so the main hurdle has been the cold, frequently in the 30’s. Recently I’ve noticed that if I run right after waking up, I’m still warm enough from being in bed that I don’t notice the cold so much. Or I’m not conscious enough to figure it out. Idaho: We managed a 500 mile drive to Boise one day. 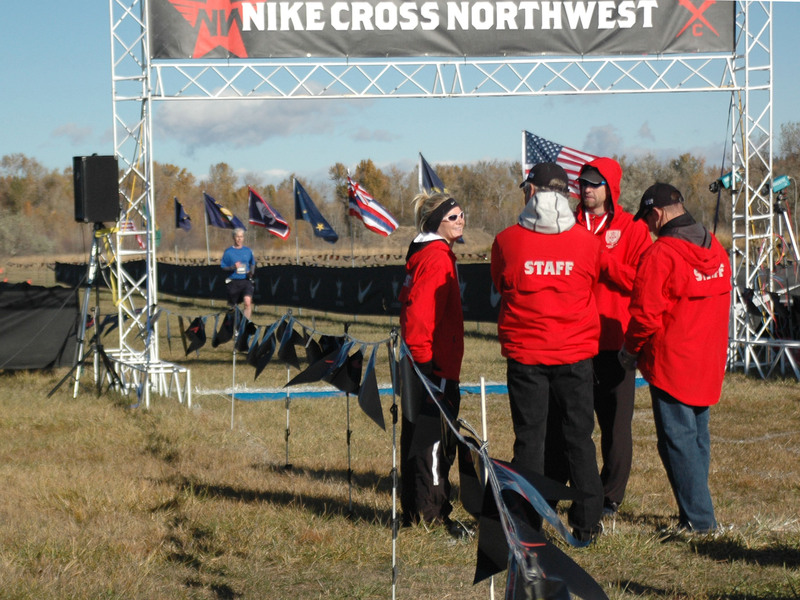 The next day I ran in the community race and then watched our son’s cross country team in the Nike Regional meet followed by a quick a 500 mile drive back home. Those drives were accompanied by tumbleweeds occasionally tumbling into the car in the high winds. This 5k run features two laps that each include a short but brutally steep hill, strategically positioned shortly after a stretch of very sandy beach to maximize pain. The beach (the light patch in the course picture HERE) seemed much longer on the 2nd lap. 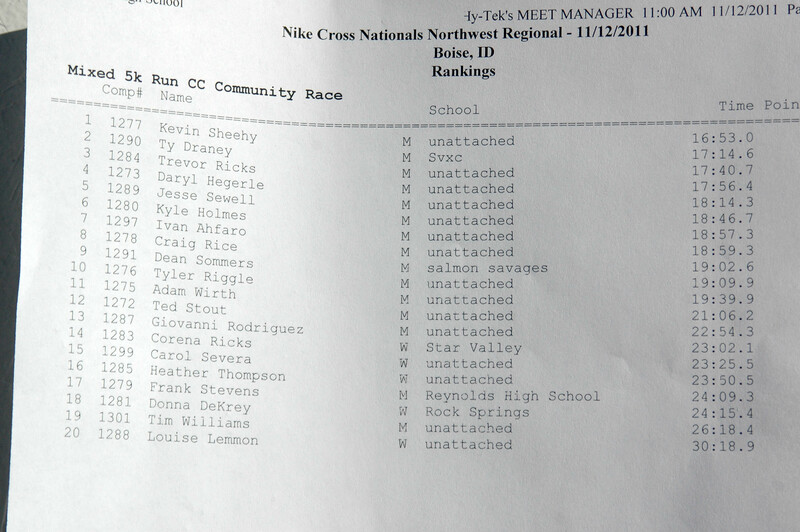 I wasn’t last and even managed to finish in the top 15 in the men’s group, which is as high as I may ever finish. Unless the next run has only 14 men. California: A few days of running in Silicon Valley means, almost inevitably, that you will have to run through a Cisco campus at some point. 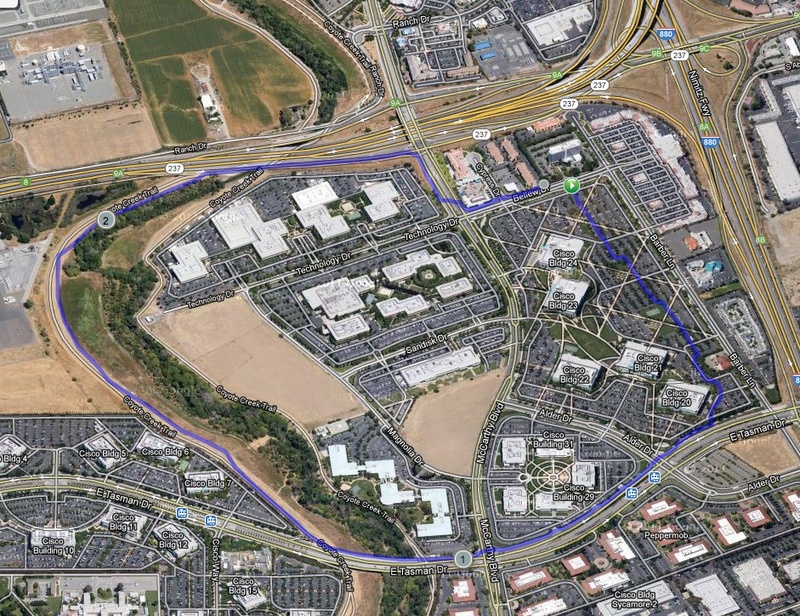 My runs started with a half mile through the campus near the 880 / 237 intersection, and then on the road over to the Coyote Creek Trail, and back along a short stretch of the 237. 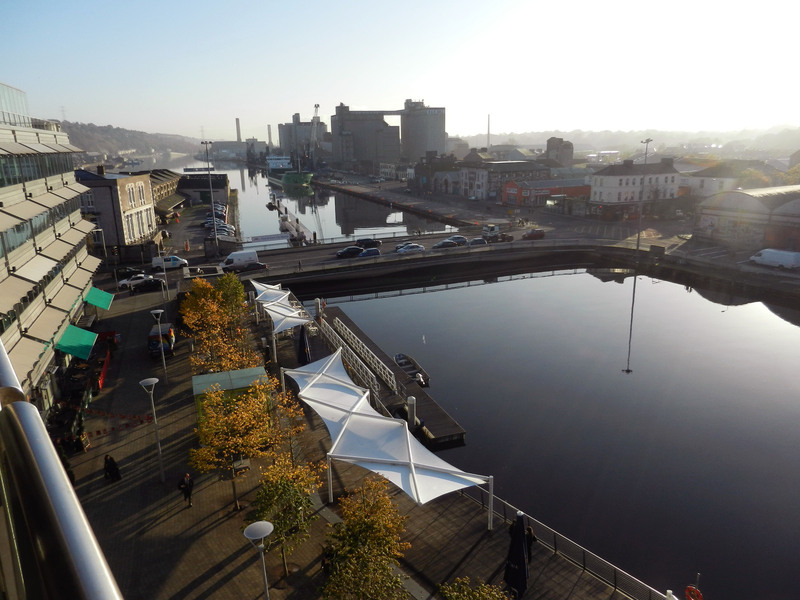 Cork, Ireland: International travel can wreak havoc on an everyday running schedule, and requires a little careful planning what with the time changes and the long hours in the air. In this case I was able to run at home on Sunday afternoon, then fly to and arrive at the hotel in Cork on Monday night about 9 p.m. and hit the streets. Halloween night. Fortunately an Irish colleague had been visiting the U.S. the previous week, so he was able to give a recommended route so I could avoid a sufficient amount of the hazardous reveling. My route around the town took me past the occasional batch of costumed lads, and I was also surprised to find an Occupy Cork group along the way by the bank street. They had their small collection of tents – rumored to be only partly filled – and a sentry out front. Or maybe he was just renting space in the open tents. A few days later I took this longer run up Blackrock Road and back by some water (click for a close up). You may notice that this one goes right by the stadium where I saw a hurling match on a previous trip. Marathons: Well accomplishment is mostly about deciding what we can claim is an accomplishment, and I applied some creative thinking toward that on one of these runs. I estimate that I averaged close to 3 miles/run over the 100 days (going between 2 and 6), certainly at least 2.62 miles on average. And that happens to be one-tenth of a marathon distance. So, with careful use of bold and small fonts, I can say that for those 100 days, I ran a marathon [worth of miles] every week and a half. Now that is impressive (sounding). Fame and glory is just a statistical extrapolation away if you word things right (and use fonts carefully). The Streak: Now that I’m in the post-100 days, there are two conflicting things pestering me. I’ve discovered the Running Streak list of those who have run at least a mile every day for a year. If you follow that link, you’ll see that there are currently 6 people who have done this for at least 40 years. And I’m only 260 or so days away from the one-year mark right now. That Running Streak site has two lists, for those still going on their streaks and those who stopped. You can imagine some human interest stories for some of the folks on both lists — such as one Geza Feld of Farmingdale NY, who at 78 has been running for over 35 years, but took off for four days in July 2007. So he’ll never improve on that 30 year streak, unless he keeps this up until he’s well past 105 years old. I’m entertaining the thought of getting on that list. But on the other hand, since somewhere before day 70 of my shorter streak, my right leg began trying to withdraw from being part of this experiment. It’s still hurting – various muscles in the upper leg – but I’m continuing my therapeutic technique of just-keep-running anyway. The last few days I’ve dropped down to one mile runs at a slow pace (by my slow standards) to aid healing, and I’m also letting a physical therapist give exercises to provide additional torture. I think I’ll know in another week or two if I’ll be able to continue. If I do, then on any longer travel, such as another trip to India, I’m going to have to plot how to do a run during the midway layover at the airport. That will be fun. Or not. If you have an exercise feat like this, let me know. Running maps traced from mapmyrun.com. Another good mapper is the daftlogic site.